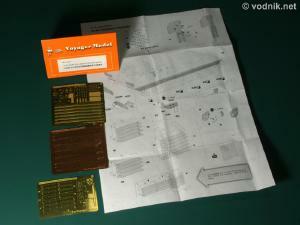 PE35014 set from Voyager is a supplement to their bigger PE Update set PE35006 for Dragon MLRS (Multiple Launch Rocket System) kits. 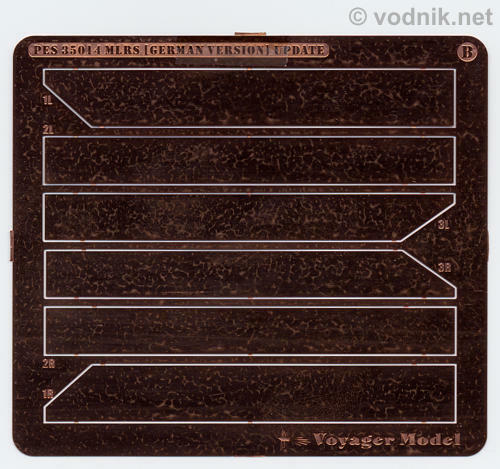 While the original set was designed for US version of the vehicle, the newer small set only includes parts for German variant (called MARS - Mittleres Artillerie Raketen System). It cannot be used separately (if you decide to use all included parts), so modelers building MARS model need to purchase both sets. 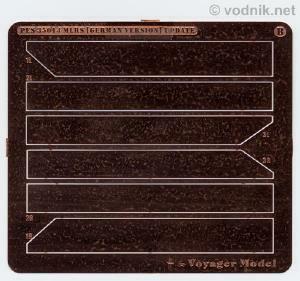 The set is packed quite unusually for Voyager, as instead of cardboard CD case we get three plastic bags stapled together with a paper flap. One page instruction sheet is folded and inserted into one of bags. Inside each bag is a single PE fret taped to the piece of thick paper, so in total we get three PE frets - two brass ones and a copper one. Click on picture to enlarge it. Instruction sheet. - new boxy exhaust shield. This part seems to be not quite correctly shaped as in reality the outer face is vertical or almost vertical, while in brass part it is quite noticeably sloped. 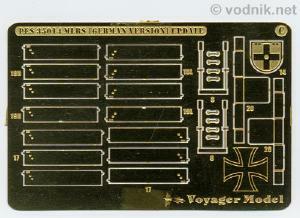 - new set of louvers for windshield armored covers - made of 0.25 mm thick brass. The only difference between these parts and those included in set PE35006 is the addition of bolt head details to each louver. 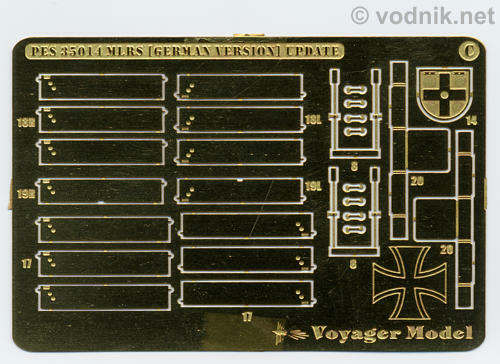 This detail however is not German specific as all MLRS vehicles have such bolts there - it was just omission in previous Voyager release, which was now corrected. Unfortunately the pivot points on louvers are still in the wrong place (located close to the edge of the lover instead on the middle of it). To use louver parts you need frames, which were included in PE35006 set. On one of the frets we get eight tie-downs. They are not mentioned on instruction sheet, but are nice addition as the original PE set for MLRS didn't include enough of them to equip the model accurately. 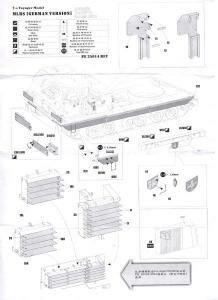 On the other hand there are parts - ABS rods - shown in instructions, which are not provided in the set. 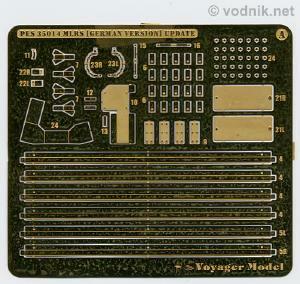 Voyager sets usually contain pieces of ABS rods - in this set we do not get any, but instructions show that pieces of 1 mm and 1.8 mm diameter rods need to be used. If you have MLRS set PE35006 you should have 1 mm rod included there, but you need to get a short piece of 1.8 mm ABS or styrene rod from some other source. 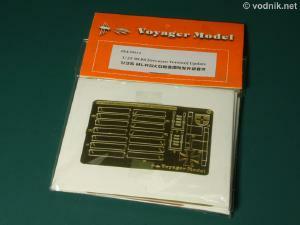 I'm not really sure if this particular Voyager's set is worth recommendation. The biggest problem of the previous MLRS PE set was not corrected - windshield armored cover louvers have pivot points in wrong place, what can make them look odd once attached. If you decide to skip installation of inaccurate louvers, all other parts included in the set can be used without the PE35006 set. 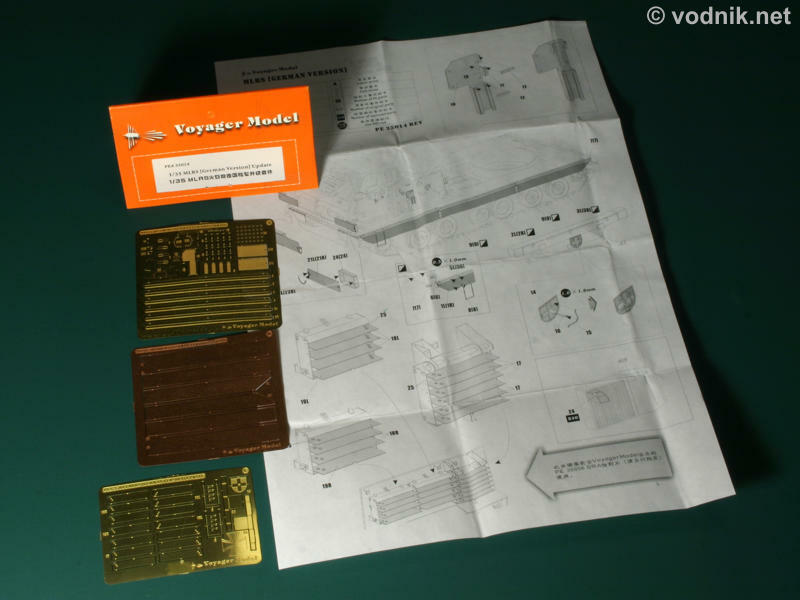 This means that for €6.50 you get nice copper side skirts and several small brass parts to improve your MARS model. Maybe this is not a poor value set after all? 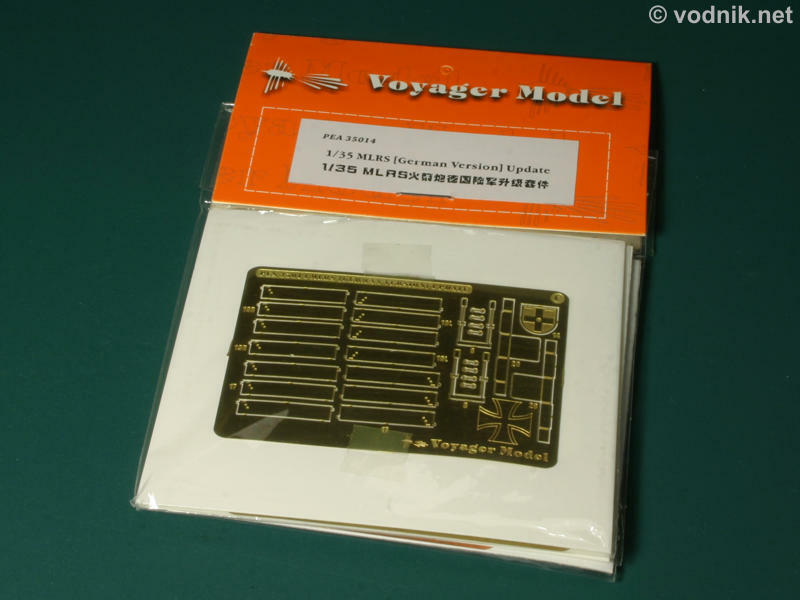 Could be better though should Voyager noticed their louvers design error.